Conscious hip hopper Steve Austin has been MCing for time and, excuse the cliché, is still keeping it very real on this latest release. 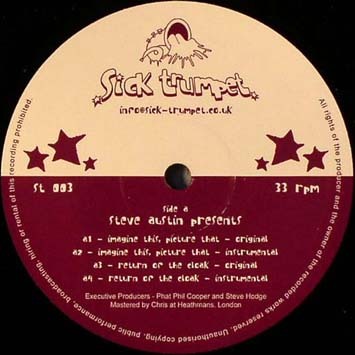 A stalwart of the UK scene, Sick Trumpet's latest release features Steve's 'Imagine This, Picture That' and 'Return of the Cloak', with mixes from rising stars Diesler and Tim Scott. 'Imagine This, Picture That' explores the biggest word in the dictionary, 'if'. We all ask ourselves how our world would be if things had happened that little bit differently, the seriously laid back grooves allow space to take in these thought provoking ideas. With Daz-I-Kue twiddling the nobs, 'Imagine This, Picture That' is sometimes tongue in cheek, sometimes deadly serious, all good. 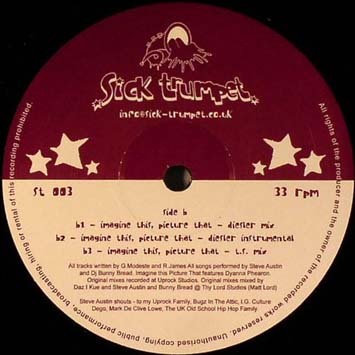 Tru Thoughts boy wonder Diesler brings out the horns stabs and the head nod beats, delivering that old-school acid-jazz bump for his mix of 'Imagine This, Picture That'. Available in vocal and instrumental flavours, both will move soulful dancefloors. Tim Scott's interpretation is the deepest, the moodiest, the heaviest. Dub influences abound as the Liverpool based producer adds broken beats and sweeping strings to the mix to create a rework for the heads. Also on the 12 inch is another Steve Austin track, 'Return of the Cloak'. Continuing his agenda to liberate his beloved hip hop from the evil corporate forces, the rhymes are simple and tough. Its a call to arms for those who believe rap music is modern blues, not urban pop, urging us to transform and get involved. If you share this view youve got to support Steve Austin in his quest, by playing this record!